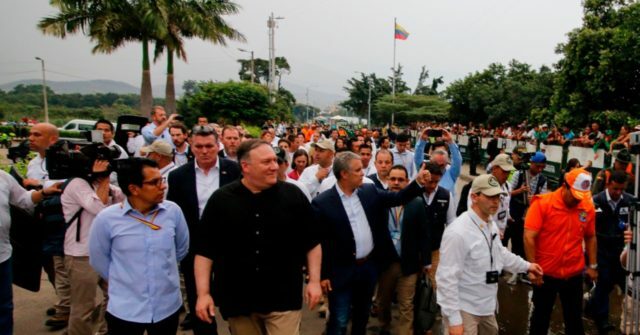 Pompeo arrived in Cúcuta to meet Colombian President Iván Duque after attending Palm Sunday services in Peru, where he also addressed the socialist crisis in Venezuela. Peru has taken in 740,000 of the over 3 million Venezuelan refugees that have flooded the region, fleeing Maduro’s socialist dictatorship and seeking food and medicine. Only Colombia has taken in more. Venezuela’s is the largest refugee crisis in the history of the Western Hemisphere and experts believe that, by the end of this year, it will reach comparable numbers to the exodus of 5.6 million from Syria that began in 2011. In Cúcuta, Venezuelans greeted Pompeo at the Colombian border with chants of “freedom!” and “intervention!” expressing support for a U.S. role in the restoration of peace to what was once the region’s wealthiest country. He then visited a refugee housing center in the city near the Simón Bólivar bridge, the only one still open to allow traffic to flow between the two nations. In his remarks after meeting with Venezuelans in the country, Pompeo emphasized the religious significance of spending Palm Sunday with some of Venezuela’s most destitute and issued an urgent demand for Maduro to allow aid to enter his country, both to help Venezuelans and to ease the pressure on Colombia to house and feed its neighbors. Mr. Maduro, open these bridges, open these borders. You can end this today. I hope that you care. I hope that you will care enough when you see the horror, when you see the tragedy, to change your ways and to leave your country. The secretary of state also demanded Maduro step down. The threat of famine and spread of preventable diseases in light of a shortage of nearly every basic medication in the country has triggered demands for a U.S. military intervention, as the Venezuelans in Cúcuta demonstrated. In several publish appearances during his Latin America tour, Pompeo refused to reject a military option as a last resort for the United States and international community to remove Maduro.